Amish Wagon Works: Think Spring! Spring is here, and with those lovely Spring days comes outdoor work that needs wagons! Cleaning up sticks, preparing the garden, planting flowers...And what could be better than a wagon to carry your equipment with you! Putting down mulch in your flower garden? The Speedway Express Aluminum Wagon has a dumping feature that makes mulching so much easier. And since it is aluminum, it is easy to clean! It can carry up to a thousand pounds, so it can also be used to haul feed, firewood, produce, and anything else you can fit into its 24 X 48 X 10 bed! Perhaps you are planting flowers and just need something to save you some bending. The Hostetler Plastic Beach Wagon might be just the thing! At 23 X 46 inches, it is edeal for carrying flowers, trowels, and soil, and the plastic body clean up easily. Not only that, but it comes in a variey of colors! Need a basic wooden wagon with a classic feel? DurableToys carries a variety of those, and just an example is the Speedway Express Series 300. 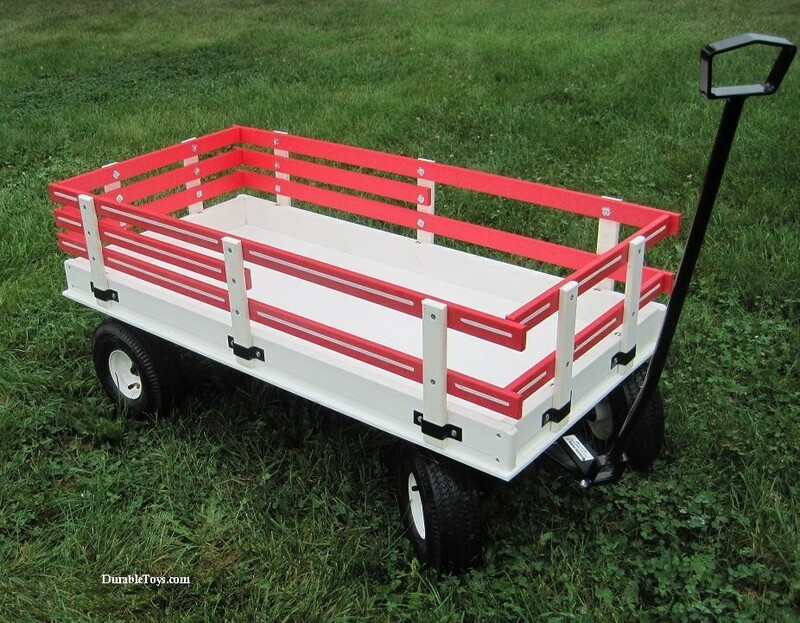 This is a multi-purpose 20 x 40 wagon with 10 inch air tires for easy hauling. Like the Hostetlwer wagon, there are a variety of color options for you to choose from. 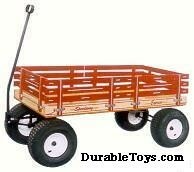 These are just a few examples of the variey of sizes and types of wagon that DurableToys carries. Check out our website today!